“I have been practicing dentistry for over 40 years. In that time, I’ve gained a deeper understanding of my patients, their fears, and their treatment. Patients often come to our office feeling anxious — as if there’s absolutely no possibility of ever having a comfortable dental experience. But with our patient-focused philosophy (and the most advanced techniques & technology available), the Advance Dentistry team is able to remove our patients’ fears and provide gentle, advanced dentistry that they can count on. Why? So that their teeth can cease to be a problem in their lives. Misc: Dr. Sayre has written numerous published articles and has lectured in Canada, Hong Kong, and Venezuela (as well as throughout the United States). He is a Colonel in the USAF Reserves and served as Chief of Dental Services of the 445th Airlift Wing, WPAFB, Dayton, Ohio. 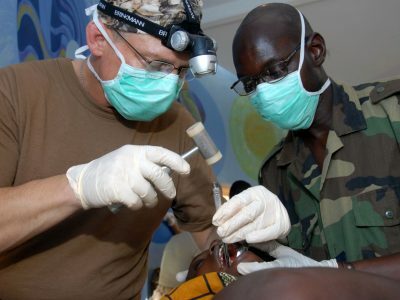 Dr. Sayre has been on many humanitarian missions including Senegal and Ghana in Africa, and Guatemala in Central America. Dr. Sayre has had a lifelong passion for planes and flying. For many years he was a member of the Lima Lima Flight Team, which is based in Chicago, Illinois. He remains a certified pilot and still enjoys flying small airplanes.